Saturday was the day. After a few weeks of looking, we had bought bunk beds a couple of days ago. Now, it was time for the boys to say good-bye to their existing beds: NHL, his twin bed, and JSL, his toddler bed. After saying goodbye, we took their stuffed animals off and packed them away in large bags. Since these are the same bags we use for garbage, we took care to let the boys know that the garbage bags were simply the best storage method and by no means meant the stuffed animals were being thrown away, Then, their sheets, blankets and pillows were removed. I took apart JSLs toddler bed first. It’s a converted crib and the only bed he’s ever known (at home at least). After that, I leaned NHL’s mattress against the wall, put the box spring in a bag and stored it and the frame in the basement. All this took me about two hours. I was sure it would take much longer. After cleaning the area up (dust bunnies love hard-to-reach areas), their room was ready. Later that day, the Raymour and Flanigan truck arrived. The kids could hardly contain themselves. Two guys came and quickly set up the bunks. Meanwhile, the kids were watching intently. They loved seeing the bed get constructed. The men putting the bed together were wonderful and didn’t seem to mind the boys over-attention. Nor did they say anything when JSL asked "Daddy, why does that man not have any hair" or when he responded to my request to explain later with "But daddy, he’s got NO HAIR!!!" Before we knew it, the beds were put together and the boys were all too eager to try them out. That’s not to say that there hasn’t been adjustments needed. NHL is a bit nervous sleeping on the top bunk. 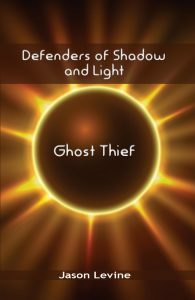 JSL can’t see his night light. I think once these adjustments are over, though, I’m sure they’ll love their new bunk beds. 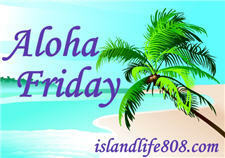 My Aloha Friday question for today is: Have you ever had bunk beds? Would you rather sleep on the top or bottom bunk? I had bunk beds on college and I am much more comfortable with the top bunk. My son and my daughter both have a set of bunk beds in their rooms and they both choose the top bunk. 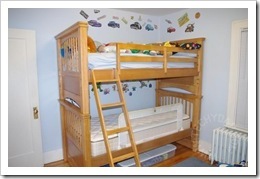 Yes we have had Bunk beds, I liked them at first, because of the space saver. However later on the making of the beds was not a joy. We got ride of it after a few years. If you can teach the boys to change their own bed, that would be great for you. Auntie E recently posted..Aloha Friday-Favorite Tech tools. I used bunk beds for quite a period of my life that I don’t much care to remember. I like the idea though. Our youngest boys (11, 13) have twin beds that can also be used as bunk beds. They used them that way for a short time years ago when they were little. But, I’m personally not a fan of bunk beds…too hard to change the sheets and my boys tend to be little daredevils who like to jump and hang off the top, LOL! When I was young we had a bunk bed. Since I was older I was on top, younger sister on the bottom. Well I fell off one night and broke my wrist…Not fun. 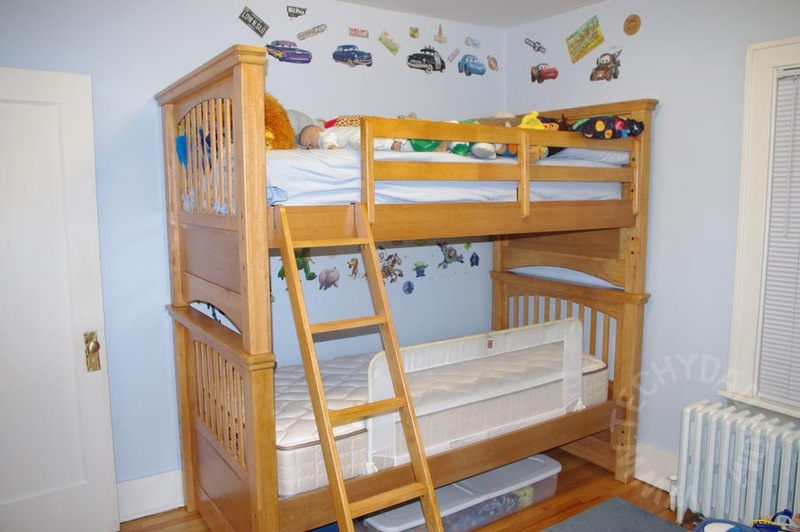 I had a set of bunk beds as a child and i liked to sleep on the bottom because it was bigger. I also just got my daughters a set and the problem is that the heat rises so much in there room that it can be freezing in the rest of the room but she is sweating on top. We are looking into bunk beds for our 7 and 3 year olds, but I am afraid the 3 year old will keep trying to climb up to the top. Did you have any trouble with the little one staying in the bottom bed? When they are up there supervised, though, I think it’s pretty safe. We didn’t have the ladder bolted on, so if need be we can remove it when they aren’t using the bed. I haven’t HAD bunk beds, but I’ve slept in them. I don’t really have a preference. My two younger kids sleep in them, with the youngest on top b/c the middle kid is afraid of heights!